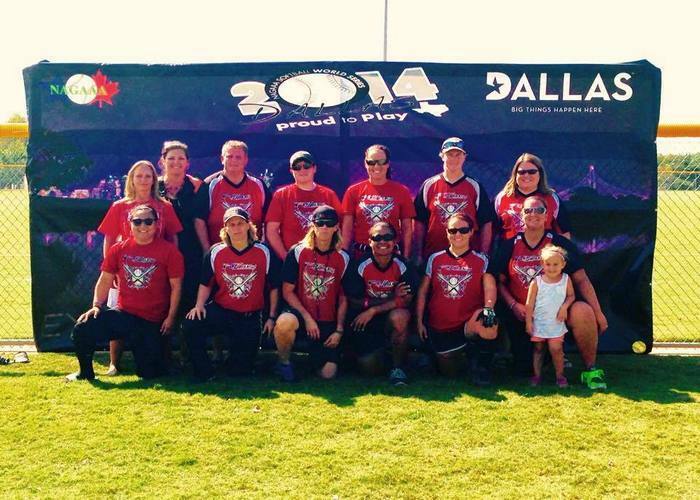 Dallas Series 2014 will be remembered for what a relatively smooth week it was and the great planning that went into what was undoubtedly one of the best Gay Softball World Series (GSWS) events in history. But another historically significant event also took place within the D Division in Dallas. The women’s division split from the NAGAAA structure in 2007 and the Amateur Sports Alliance of North America (ASANA) was created strictly for women. There had not been an all-female team competing at the GSWS since that restructuring. And according to common knowledge within the gay softball community, there had never been a team completely comprised of women playing in the Open Division at the GSWS since the tournament began in 1977. However, the NAGAAA website reveals how strongly the organization values the meaning an “Open Division” has to its membership. The words, “Open Division” are listed below the logo on the front page of the website, another reminder that everyone is welcome within the rules set by the instruments of governance; women are no exception. Enter the Knoxville Fuzion to Dallas Series 2014. The Fuzion, an all-women’s team from Knoxville, Tennessee qualified for the GSWS out of the K-Town Softball League as one of that league’s two D Division GSWS representatives along with the Knoxville Cyclones. The Fuzion finished tied for third place in their hometown league’s D Division and the team had good showings at several NAGAAA-sanctioned tournaments prior to the World Series in 2014 in spite of their loss. Brandi Crass is a K-Town Softball League executive board member and Fuzion manager. “Our team has been a member of K-Town for nearly seven years. Although we played in the open division in the fall league, this past spring was our first season to compete for a NAGAAA World Series bid. We feel our league has always been supportive of Fuzion,” said Crass. After a tough regular season schedule in Knoxville and some tournament play throughout the year, Fuzion was ready to compete at the GSWS. The Fuzion’s pool play grouping was one of the most competitive in the entire D Division tournament. But after dropping its first two games of pool play, the ladies from Knoxville were able to get past the Chicago Jox 13-7 to secure their first World Series win as a team. Fuzion members knew they could compete at an international tournament but getting to the World Series wasn’t a team goal initially. “In all honesty, winning the bid to World Series was the furthest thing from our minds. We entered the Open Division to help better our level of play by competing with different teams than we were accustomed to playing in the Women’s Division,” added Crass. NAGAAA is truly one big family. And while there are disagreements and competing points of view from time to time, everyone is accepted for who they are and for the unique talents that they bring to the sport. Crass told us that this World Series was no different. “While at the World Series we realized we were a bit of a buzz when many of the teams came to our games to show support for our ladies. In turn, we also stood by their sidelines, cheering them on. We were blessed with the support of our local teams who came to cheer us when scheduling would permit,” Crass said. There has been talk for years about NAGAAA bringing a women’s division back into the fold. However, no real progress has been made on the topic. For opponents of a NAGAAA women’s division, the Knoxville Fuzion went a long way toward making the case for one. If the Open Division is truly “open” and an entire team of women can play in the open division, then is a women’s division necessary in NAGAAA? Folks that are critical of that line of thinking surely can’t use a lack of competitiveness as their argument after the showing these ladies from Tennessee made at Dallas Series 2014 in spite of their loss. The Fuzion’s win/loss record at the 2014 GSWS couldn’t be less important. But what the Fuzion represented there couldn’t be more important. This group from Knoxville proved that NAGAAA is a place for everyone – gay, straight, bisexual, transgender; men AND women.